All ET&T products carry a standard 1 year limited warranty (start on the invoice date) against defects in materials and workmanship; 6-month for consuming accessories, such as battery and etc. This warranty policy does not include ODM/OEM products, contact our sales for more details. This limited warranty covers only defects encountered during normal use of the product. This limited warranty does not include service to repair damage from improper installation, accident, disaster, misuse, abuse or modifications to the subsystem or by other cause unrelated to defective materials or workmanship. 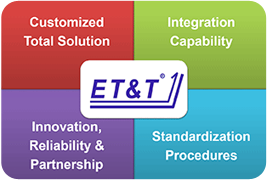 If the product fails during normal and proper use within the warranty period, ET&T will repair the product at no cost. Products probably shall be treated as out-of-warranty and customers shall be billed for repair and shipping charges when products failed due to misuse, accident, improper installation or unauthorized repair.